Get your zen on with this illuminating Solar Yoga Garden Owl. As the sun sets and dusk settles in, the solar glass crackle balls will begin to glow. 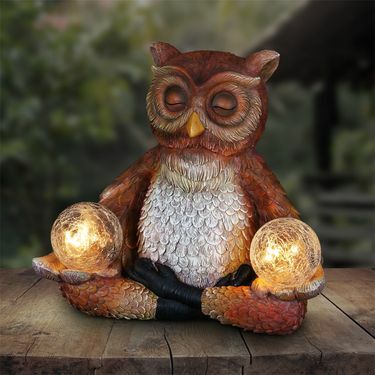 Meditating Owl is beautifully hand painted and makes a great gift for the garden enthusiast and yogi alike. Solar powered LEDs provide an enchanting glow at dusk! Made of durable resin, UV treated to resist fading. Size: 7.25" x 10" x 9.5"H., approx. 4 lbs.